The MicroSnorkel/MicroCentipede is the basic components for the Pondless Feature. It is simple to use and fits in with designs not requring the waterfall box. We have also used this unit in ponds to protect the pump from algae and fish getting caught in a pump. 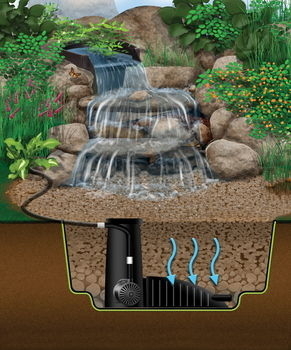 The water held within the open spaces of the gravel flows down toward the MicroPondless filter which is made up of the Centipede Module and the Snorkel Vault. From there, it gets pumped up to a falls box (waterfall unit), where it flows back down through the gravel bed (or into pond) and the cycle begins again.